A one-time price of $985.00 will be added to your order. Fits most adults and children. This revolutionary seat design gently supports you in the best sitting position possible to relieve and prevent back pain, while giving you complete mobility for seated work. 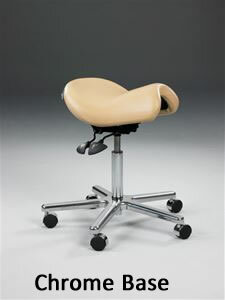 More anatomically contoured than other saddle seats. Deeply sculpted front pommel and rear cantel stabilize your pelvis in an upright orientation for healthy spinal posture. Your natural spine curve is maintained, even when you lean forward, and the pain or fatigue associated with muscular tension is dramatically reduced. 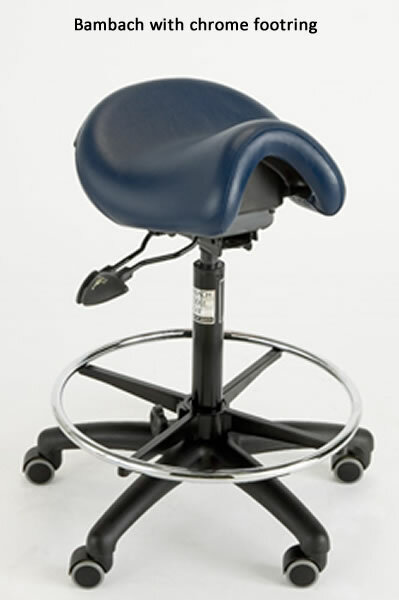 The Bambach Saddle Seat comes with adjustable seat tilt to give optimum balanced position to suit your working habits, high density padding for all day comfort, and comes in a choice of fabrics or leather. 5 year warranty against defects and workmanship with normal wear for the original purchaser. See Bambach Color for Upholstry for your fabric selections. For critical color matching please Contact Us for a free fabric swatch, as computer color displays are notoriously inaccurate. Hager Worldwide warrants that this product is free from defects in workmanship and material, exclusive of coverings. A claim made under warranty must be submitted with proof of purchase and returned to the dealer. A claim under warranty will not be accepted if the product has been defaced, changed or tampered with or improperly used or installed, or if the claim arises out of damage or loss during shipmentor for any use that exceeds the published capacity of the product. A Bambach returned in accordance with Hager/Bambach return goods policy for inspection and found defective will, at the option of Hager/Bambach, be repaired or replaced at no charge, but no claim for outside labor or charges will be permitted.